Hiya guys! 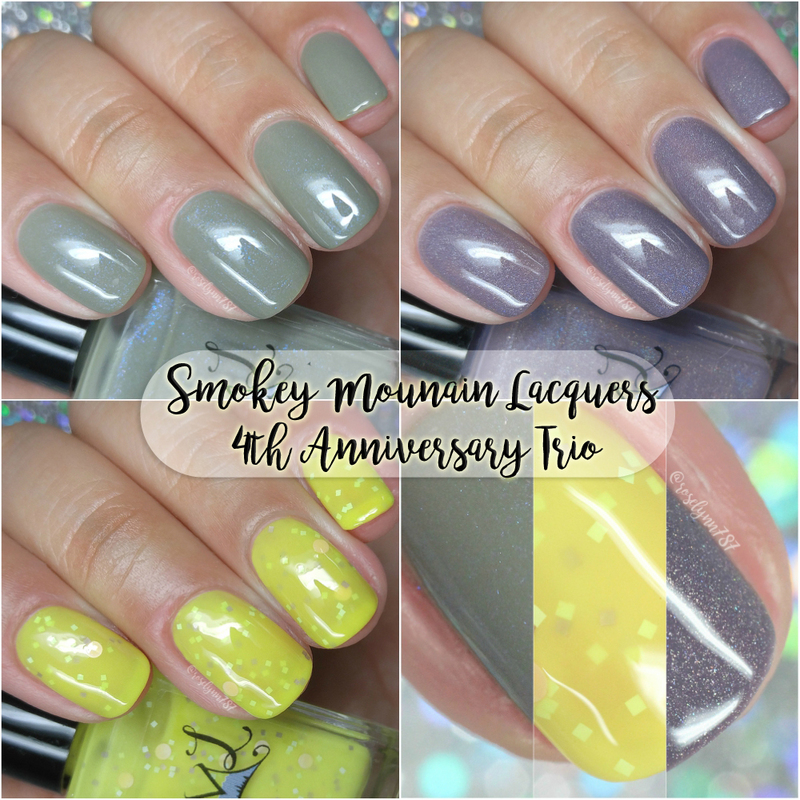 Today I'll be sharing swatches for the 4th Anniversary Trio by Smokey Mountain Lacquers, which consists of three gorgeous shades in different finishes. A big congratulations to Kim for an amazing four years in business! I've been working with Kim for a little over a year now and it has been nothing short of fantastic. She's a true professional in every sense of the word and needs more recognition for the beautiful polishes she creates. But really I'll let the shades talk for themselves, let's get to the swatches! The 4th Anniversary Trio by Smokey Mountain Lacquers will be available for purchase Sunday, August 20th through August 24th. Each full-size bottle will retail between $8.50 to $11, depending on the finish. There are also mini-size for retail between $6 to $7. The trio may be purchased as a set for $25 for full size and $17 for mini size. Sage Me The Details can be described as a sage crelly with blue shimmer. Oh my gosh, that shimmer though! The formula has a sheer and smooth application that builds up nicely on the nail. It has very even coverage and a balanced consistency. The shimmer is very subtle, but definitely plenty visible against the base. It dries to a gorgeous high-shine finish on its own. Shown in three coats and sealed with a glossy topcoat. Smoke and Mirrors can be described as a dusty smoky purple holo. The formula has a really opaque application, but not enough to be a one coater. Again it has a very nice balanced consistency, not too thick or too thin. The holographic finish is really subtle in my photos, but it's much more sparkly in direct sunlight. It dries down to a smooth finish and I didn't have any staining on removal. Shown in two coats and sealed with a glossy topcoat. Yellow To Four Years can be described as a yellow crelly with cotton candy pink dots, mint square and lavender square glitters. I feel so strange writing this about a yellow shade, but... I actually am head over heels for it. I was definitely not expecting to like it, let alone love it. 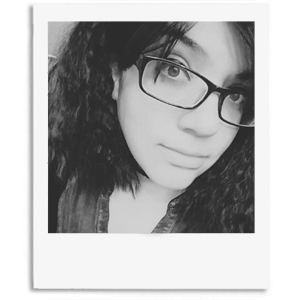 It ends up complimenting my skin tone really well and has that right tone to make it perfect for Fall. Hands down my pick for must-have. The formula has a really sheer application that leans more towards being like a jelly. It has a minimal visible nail line after layering a few coats. The consistency leans a bit on the thin side, but it actually ends up working well for fantastic glitter distribution. There is no need to fish, not even for the larger glitters. It dries down to a very minimal gritty finish that smooths out after topcoat. Shown in three coats and sealed with a glossy topcoat. To recap, the 4th Anniversary Trio by Smokey Mountain Lacquers will be available for purchase Sunday, August 20th through August 24th. Each full-size bottle will retail between $8.50 to $11, depending on the finish. There are also mini-size for retail between $6 to $7. The trio may be purchased as a set for $25 for full size and $17 for mini size.